Aromatherapy is an ancient art combining the use of essential oils with therapeutic massage. The oils are extracted from plants, are very powerful and highly concentrated, and need to be diluted before being used on the skin. 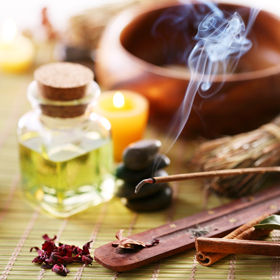 Aromatherapy has an established place in western medical treatment as well as being used as a complementary treatment. The essential oils used in aromatherapy possess natural healing properties, and when used correctly encourage the body’s natural healing abilities. The combination of these healing properties with the touch and the aroma allow the body and mind to be addressed holistically. When skilfully blended, by a qualified practitioner, for your specific requirements, essential oils exert a subtle but powerful influence on the mind and body which offers a gentle way of achieving harmony and balance in your life.